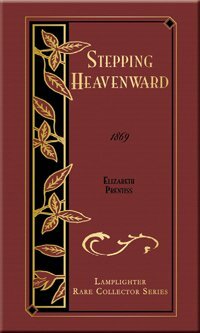 Stepping Heavenward is an intimate journal of a young woman who struggles with ordinary daily life just as we do. Her life is a constant endeavor to "step heavenward" as she deals with disappointment, heartache, and tragedy. You'll find it hard to believe that this journal has not been written with your own pen! This treasure of womanly wisdom is crucial for any woman with a heart's desire to know God. From Rebekah of Saint Louis, Missouri on 11/9/2018 . This is a beautiful edition of a wonderful and edifying book. I read it first when I became a new Christian, and then again 23 years later. I thought I might not get as much out of it the second time, but I was wrong. There's a reason this is a classic of Christian literature! From Anonymous of Seneca, Missouri on 4/12/2018 . Stepping Heavenward is an incredible book! Every time I read it, I am encouraged and challenged. The struggles that the main character has are so real...things we all can deal with. May you read this great book and be inspired in your own walk Heavenward! From Anonymous of Williamson, New York on 1/28/2015 . Bought it for my granddaughter as a gift. She loved it! I have bought her several Lamplighter books because she loves them and wants to keep them as heirlooms. From Margaret De Villiers of Campbell, California on 9/15/2014 . I bought this book for a friend, as I have previously read it and love the story. This is a beautiful edition and definitely keepsake material! It made for a very elegant gift. Every Girl Should Read This! From Jessica Alise of Baton Rouge, Louisiana on 9/15/2014 . This is a favorite in my family. Not only is it a gorgeous copy of the book, but the book itself is amazing. It's the story of one girl's journey to womanhood and maturity in Christ. There is humor, heartbreak, and many lessons along the way that will challenge you in your own life.